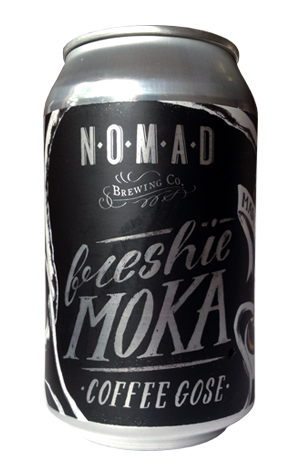 When Nomad first experimented with the gose style by adding local seawater and native pepper, they weren't to know they were about to strike the jackpot with the creation of Freshie, a beer that’s gone on to become a firm favourite that's dispatched all around the world. So you can understand why they’d want to keep the experimentation going, which is how we’ve ended up with a series of seasonal siblings starting with a Freshie base but all featuring slightly left field ingredients; summer was desert lime, autumn was caramel and now, released just before the end of winter, we've got a coffee gose called Moka. On paper this seems the hardest sell of the bunch. Adding a robust ingredient such as coffee to what is a quite delicate beer seems destined to only go one way, and the beer ain’t gonna win. And here you do find the coffee character from the cold espresso dominating the aroma and the flavour. And, yet, the longer you linger the more the gose character comes out, its little salty lick refusing to be stamped out by its caffeinated counterpart. The idea for doing such beer is a kind of reverse engineering based on a tradition in Napoli where locals, apparently, add a sprinkle of salt to their morning coffee. Like this beer, it sounds like quite an odd idea. But if the beer is any indicator, this whole coffee and salt thing is rather more pleasant than it may sound.